How many of us spend significant amounts of our time taking our children to medical appointments, often many miles from home? Often several appointments at the same clinic are staggered across a few weeks when it would have been much more logical with a little bit of planning to have them all on the same day, so the journey only had to be made once. This is particularly the case when the child has one of over 6000 rare conditions or one that is so rare, it doesn't have a name. Consultants are few and far between and in high demand, making long journeys to see them unavoidable. At the recent Rare Disease UK conference, I met an extraordinary woman who is leading the way to changing this for children with rare and undiagnosed conditions in Birmingham. 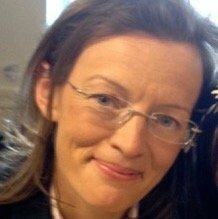 Dr Larissa Kerecuk, is a Consultant Paediatric Nephrologist and the Rare Disease Lead at Birmingham Children’s Hospital. She is developing a children's holistic rare disease clinic that offers integrated care so families can get a better standard of care. Today, ahead of Rare Disease Day at the end of the month, Larissa has written for SNJ about her plans and how you can help make it a reality. At Birmingham Children's Hospital, everything we do is aimed at improving the care delivered to our patients. Given that we treat approximately 9000 patients with over 500 different rare diseases, it was very important to us at BCH to develop a rare disease strategy to address the keys improvement areas highlighted by Rare Disease UK. Therefore, Birmingham Children’s Hospital are developing the first holistic Paediatric Rare Disease Centre where multi-disciplinary and multi-speciality rare disease clinics will take place with coordination of care, peer support and better access to research, information and treatment. We are, and have been, consulting with patients and patient support organisations throughout the process. In the initial design process, families have told us that a large waiting area where they can interact with each other and patient support organisations is important, so we have incorporated this into the design. We have also included a kitchen for our families to improve the quality of their stay as well to provide a facility for them to feed their children any special feeds that they are often on. Several of our patients have multiple sensory deficits, learning difficulties and/or may have autistic spectrum features, so we have also ensured that we have a sensory room and a “chill-out room”. As many of our patients and their families are wheelchair users, all of our doors are wider and the toilets are suitable for all our patients – including an adult changing room. It will also enable families to meet other families affected by such conditions and provide much needed peer support. We believe that the first holistic paediatric rare disease centre will help to re-think the care we deliver to patients from a one-size fits all to a patient-centred approach. We also have the support of many patient organisations who will attend those clinics too. The Rare Disease Clinics will also integrate the transition between specialities through into adult care and also with antenatal and genetic services to provide a seamless, rather than disjointed service. The only way to advance rare diseases is through research and it is a right of patients to be offered research that is available to them, so this will be the ethos of the Rare Disease Centre Clinics. This means that research teams will have dedicated space to see the patients at the same visit to help them spend more quality time away from hospital. At BCH, we believe that the first holistic paediatric rare disease centre will help to re-think the care we deliver to patients from a one-size fits all to a patient-centred approach. This helps patients and families with rare diseases lead the best quality of life possible, thereby enabling to live their lives to their full potential. If you have any ideas you’d like to share, or have any questions, then please do let me know. Your insight, knowledge and expertise is exactly what we need to develop a world-class Centre for Rare Disease which is more than just a building but a new holistic concept in care delivery! The funding for the new Rare Disease Centre is being raised by our Birmingham Children’s Hospital Charity through the Star Appeal. Every child is special and every child deserves a chance to shine. By supporting our Star Appeal, you will be helping to fund the UK’s first holistic centre for children with rare diseases and undiagnosed medical condition - providing coordinated care, treatment and support to brighten the lives of our little stars. Support Birmingham Children’s Hospital Charity’s Star Appeal and help us to raise £3.65 million to create the first children’s rare diseases centre in the UK - providing coordinated care, treatment and support to help to brighten the lives of our little stars. Below are some of the exciting things we have going on at BCH in the next few months. Take a look and why not get involved? While the Rare Disease Centre is being built, we have applied for funding from the Roald Dahl Marvellous Children’s Charity to fund two posts to help to coordinate the care of children with rare diseases. Families gathered at an event last September to help co-design the posts to fit their needs and parents were also involved in interviewing for the posts. We now have in post two new members of staff: Kate Penny-Thomas as Roald Dahl Rare Disease Nurse and Sian Bicker who is the Roald Dahl Genetics Nurse. Making a diagnosis is very important, which is why we are also involved in the 100 000 Genome Project. The UK will become the first ever country to introduce this technology in its mainstream health system with the aim of personalised medicine. 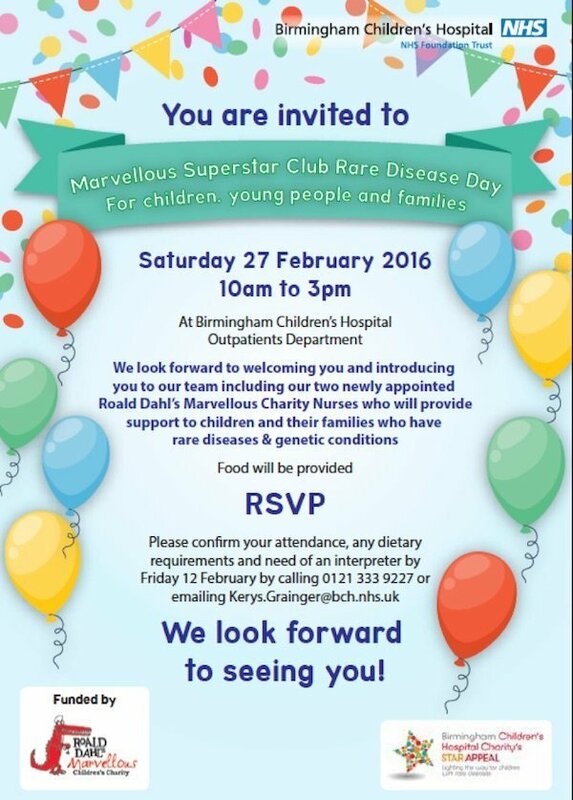 Birmingham Children’s Hospital is recruiting patients with rare diseases without a genetic diagnosis for this project. We have over 210 participants already which shows how keen our families are to obtain a diagnosis. We are also working with SWAN UK to develop SWAN clinics at Birmingham Children’s Hospital Rare Disease Centre for children with syndromes without a name. Sian Bicker, our Roald Dahl Genetics Nurse, is already supporting families in the 100K Genome Project and will also support families in the SWAN clinics. The aim of the event is to promote Rare Disease Day and it is an opportunity to speak to the public about Rare Diseases. The event will be at Talking Point on Level 3 which is a large space situated in an extremely busy area of the museum outside of the Planetarium. The majority of visitors to the museum will make their way to this area at some point during their visit. Please come along and publicise to anyone and everyone! If you are interested in having a display/stand for part of the day (10 – 3 pm), do contact me, Dr Larissa Kerecuk, Rare Disease Lead at Birmingham Children’s Hospital (sec kerys.grainger@bch.nhs.uk; 0121 333 9227). So far we have three stands: NIHR Rare Disease Translational Research Collaboration with posters and games for the children to do on the day. Professor Barrett will also be at the event with members of the Clinical Research Facility team. Our Birmingham Children’s Hospital Charity will be raising awareness of the Star Appeal, together with Roald Dahl Marvellous Children’s Charity and you'll be able to meet members of Rare Disease UK and SWAN UK too. As we develop the First Paediatric Holistic Rare Disease Centre in the UK, Birmingham Children’s Hospital are holding a week of events to raise awareness of Rare Diseases. Therefore, we wanted to invite everyone to come along and display their stands, do a talk, meet our team or just come and visit our fantastic hospital. The events will take place at lunchtimes in main outpatients and in our conservatory (with coffee shop) from Monday 22nd February until Monday 29th February. This will be the highlight of the Rare Disease Week at Birmingham Children’s Hospital and is kindly sponsored by the Roald Dahl’s Marvellous Children’s Charity. We look forward to welcoming you and introducing you to our team including Sian Bicker and Kate Penny-Thomas, our newly appointed Roald Dahl Genetics and Rare Disease nurses, respectively. The day will involve a mixture of talks for families (inspirational, practical and psychological) as well as workshops. For the children and young people, we have a very exciting entertainment programme with magic show, face painting, singing, karaoke, games, music and even rare animals! If you are interested in taking part or attending, please contact Dr Larissa Kerecuk, Rare Disease Lead, at Birmingham Children’s Hospital (kerys.grainger@bch.nhs.uk; 0121 333 9227).